Another classic for the 2012 Classics Challenge: The Happy Prince and Other Fairy Tales by Oscar Wilde. This book of little moral tales is charming. I wish it had been read to me as a child, so I am keeping them book to read to my own children (when I have some ...). I was put onto this book by the First Tuesday Book Club. 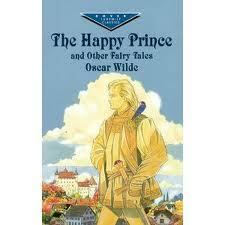 The Happy Prince is one of the nine fairy tales written by Oscar Wilde. It is the tale of an ornately decorated statue who is saddened by the poverty around him. So he asks his only friend, a late migrating swallow, to take his jewels to those in need. When the Happy Prince has given all he has, and is no longer so beautiful, the rich men of the city meet to decide his fate. The Happy Prince's selflessness opens up the eyes of his friend, the swallow. The swallow doesn't feel the cold of the winter, because he is warmed by doing good and bringing joy to the needy. The swallow eventually sacrifices his life, by not migrating, and dying from the cold, once his task of dispersing the Happy Prince's riches is done. What I found interesting throughout these fairytales, and which I don't really appreciate in a child's book, are some of Wilde's own views put across - such as some very religious references, and also some references to Jews. I found them subtle and confronting. All these fairytales are little tales of morality. I really enjoyed them. Great lessons for kids.